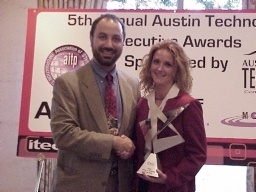 On October 2, 2002, the Austin chapter of the Association of Information Technology Professionals (AITP) presented the fifth annual Austin IT Executive of the Year Awards in conjunction with the Austin ITEC - the region's largest gathering of IT executives, educators & vendors - and the Austin Technology Council - providing opportunities to connect, learn, and grow. The ITEC/AITP/ATC awards ceremony was held at the Four Seasons Hotel, and it was attended by over one hundred and fifty area IT professionals. "This event continues to be an important reflection point for the talented IT community in Austin," said AITP president, Scott Calvin. 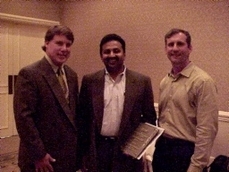 "We're proud to honor leading IT professionals such as John Ciulla, Joe Harlow, and Jikku Venkat who demonstrate tangible leadership and achievements." "The Austin Technology Executives of the Year awards are the only awards recognizing Austin CIO, CTOs, VPs of Engineering and their peers," said Paul Toprac, executive director, Austin Technology Council. "These leaders emerged because of their continuous efforts, talent and leadership, which serves to propel Austin to the forefront of technology innovation." The primary sponsors of the event were Advanced Micro Devices, IBM, and Momentum Software. Three major awards were presented: The Austin IT Executive of the Year - Private Sector, The Austin IT Executive of the Year - Public Sector, and The Austin Information Technologist of the Year. 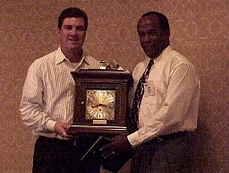 As the CIO of Vignette, John Ciulla has responsibility for both the IT function and Facilities organization creating a unique blend of Operation functions known as "FIT" (Facilities, Information Technologies) This blend and John's leadership has turned FIT into a highly efficient organization that has executed on every level in extreme business conditions. Some examples have included the creation and implementation of innovative business processes such as change management, asset deployment and redeployment, a Technology Capital procurement process, and a unique mobile workforce solution. His leadership was responsible for the creation of SOMA (Sales Opportunity Management Application) using JAVA based code to meet a critical need of the Sales Force. John Spearheaded the Integrated Vignette Global Marketplace Web service into the IT organization without service interruption while reducing costs by over 50%. He implemented a highly efficient remote access method allowing centralization of services with higher reliability and significant cost savings. Vignette's utilization of Brio reporting creation has also allowed real time information to be feed to the Business Unit Owners in a timely fashion. 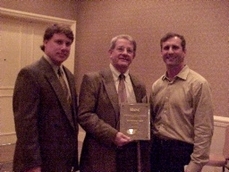 John has also created a multimedia department that has received national recognition for it's innovation and abilities. John has also kept up a high departmental morale and retained his high performing team members in extremely challenging business environment. In these challenging times he has created and nurtured methods such as a social committee, quarterly awards, peer recognition, team building, and mentoring which has resulted in a cohesive group that consistently exceeds it's goals. As a concerned member of the community, John also supports the donation of excess equipment to many non-profit organizations such as the Christian Women's Job Corps and AISD. 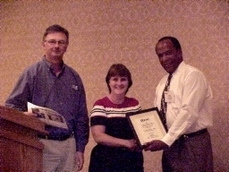 Runner up for the award was Susan Quimby, Director, IT, Motive Communications. Joe has presided over the implementation of "Texas Online" by utilizing state investments of infrastructure which has in turn resulted in significant cost avoidance for Travis County. He was responsible for the negotiation and implementation of several key enterprise wide eGovernment applications which included a Tax Office payment application (with over $ 1,000,000 in tax payments made in the first year) and an internet based voter registration system. 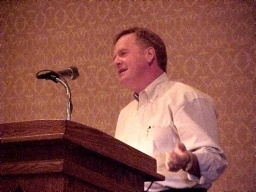 He is now developing applications to provide internet access to online public records from the County Clerk's office, to provide internet Jury enrollment, and to provide a global ePay application to allow a taxpayer to pay any fine, fee, or service from all county departments using a credit card. Joe also lead the implementation of video conferencing to facilitate communication between attorneys, court rooms, and defendants retained in jail. Attorneys may interview their clients via video rather than traveling to the Del Valle jail facility. He also lead the integration of multiple systems to provide an Integrated Justice System which ties law enforcement, the District Attorney, the Civil and Criminal courts, and the Probation systems into an integrated database. 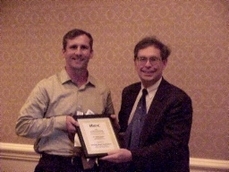 Runner up for the award was Randy Ebeling, Associate Vice President for Information Technology and CIO, University of Texas at Austin. As the current CTO and the former VP of Engineering for United Devices, Dr. Jikku Venkat and his team are responsible for the strategy, development and implementation of all United Devices products. The United Devices flagship product, the MetaProcessor platform, has been under Dr. Venkat's supervision from its inception to delivery to the market. The MetaProcessor platform is distributed computing software designed to harness the existing under-utilized resources (mainly PCs) on computing networks to create a virtual supercomputer capable of solving compute-intensive problems very quickly. The cost-effectiveness and price-performance of this solution is orders of magnitude better than conventional high-performance computing solutions. The MetaProcessor platform has changed thinking in the science community by literally facilitating projects that were previously unimaginable or infeasible due to compute-resource constraints. For example, the MetaProcessor platform is the backbone for the world's largest commercial computing grid, which is currently running the largest chemistry project in history. To date, more than 1.7 million PCs have contributed to the United Devices Cancer Research Project, erasing years off of the search for a new cancer therapy by accelerating the discovery process. Two major and two minor releases of the platform were brought to market in 2001. Novartis Pharmaceuticals, one of the Top 5 drug companies in the world, has adopted this technology. Other enterprise customers, including NTT Data in Japan, have selected United Devices as well. Runner up for the award was Dr. Albert Edgar, Chief Scientist, Applied Science Fiction. This year's recipients were chosen by Cynthia Beath, Professor MSIS Department, The University of Texas, Ray Schwitters, President, Triangle Technology, Sonia St. James, CEO/President, Technical Business Network, Martin Wilbanks, The York Group, and Paul Toprac, Executive Director, Austin Technology Council.